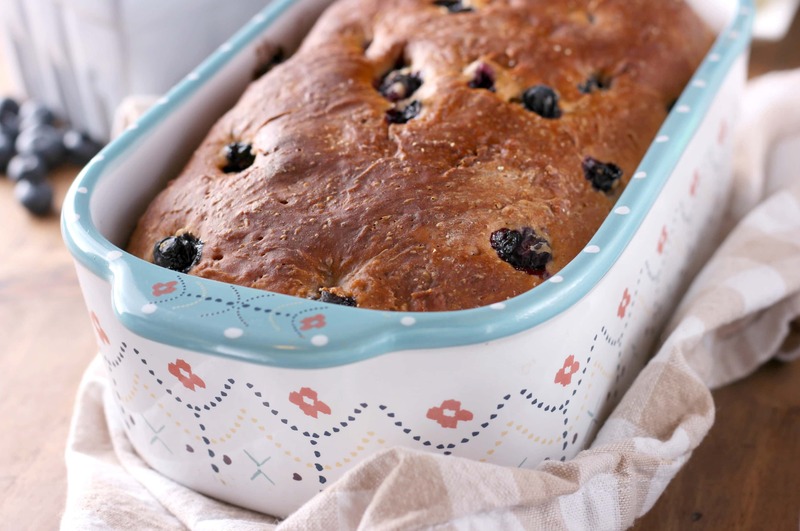 With the classic crusty outside and the soft, chewy inside, this Blueberry English Muffin Bread is sweetened with maple syrup and is bursting with fresh blueberries and cinnamon! Soon to become your new morning favorite! This post is sponsored by Red Star Yeast. As always, all opinions are still 100% my own. It’s been awhile since I’ve posted a bread recipe, but that definitely doesn’t mean that we haven’t been making and eating bread! Even though bread making slows down in the summer because I don’t use the oven as often, I just can’t resist fresh, homemade bread. 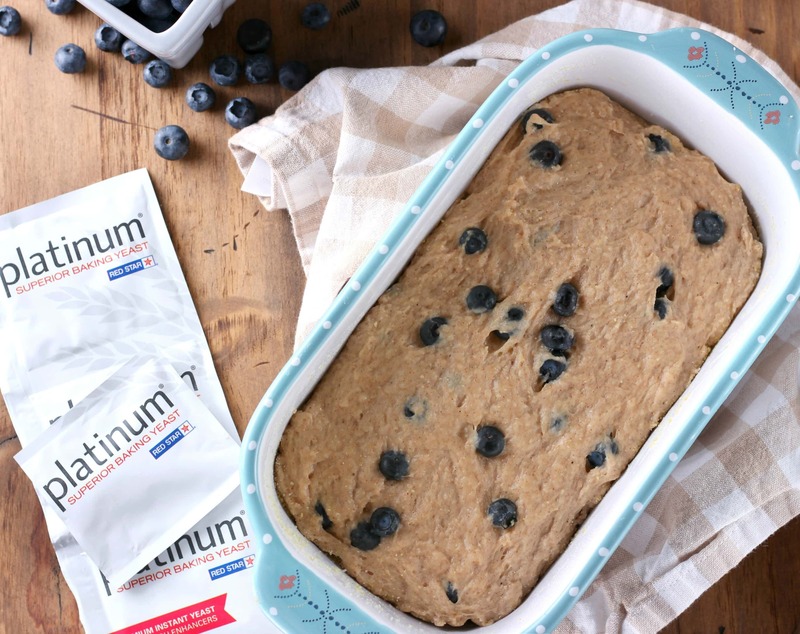 So, toast is still a regular part of my morning routine, and this blueberry english muffin bread has been making my mornings a little tastier! 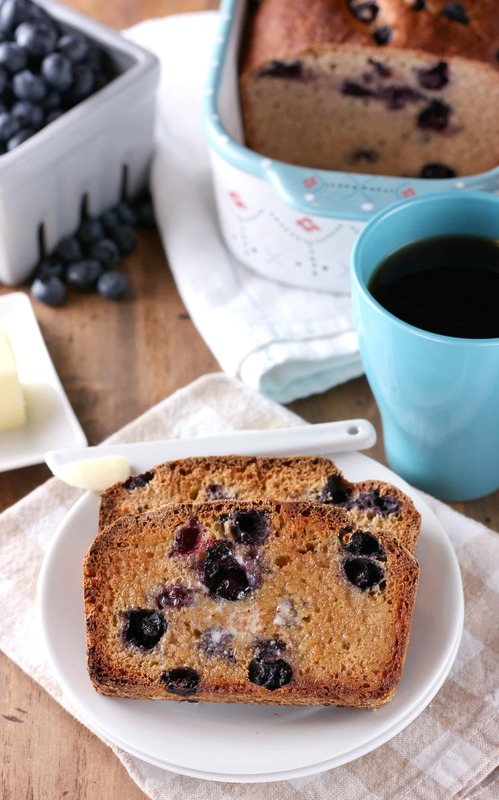 With a hint of cinnamon and nutmeg and lots of fresh blueberries folded in, this english muffin bread makes the best toast! Crunchy on the outside and chewy on the inside just like a classic english muffin. The perfect pairing to my morning cup of coffee, or in my husband’s case, glass of milk! As with all my favorite recipes, it’s super easy to make. 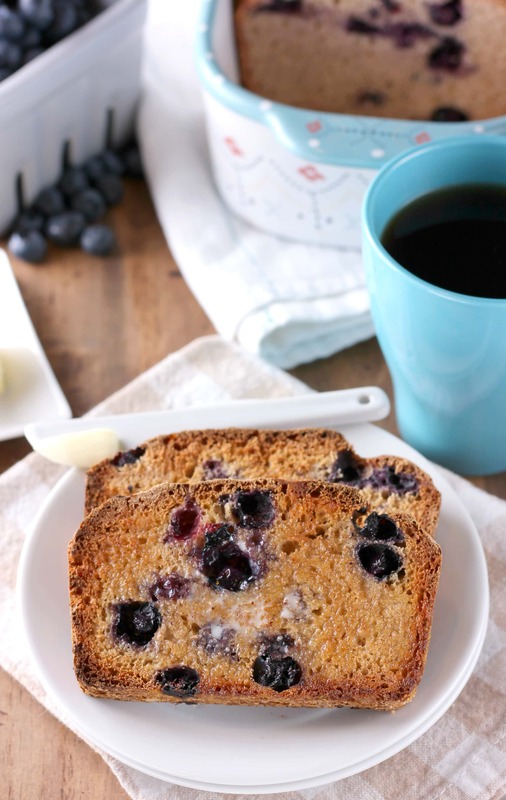 This blueberry english muffin bread is actually a variation of my favorite cinnamon honey wheat english muffin bread. The prep is easy. 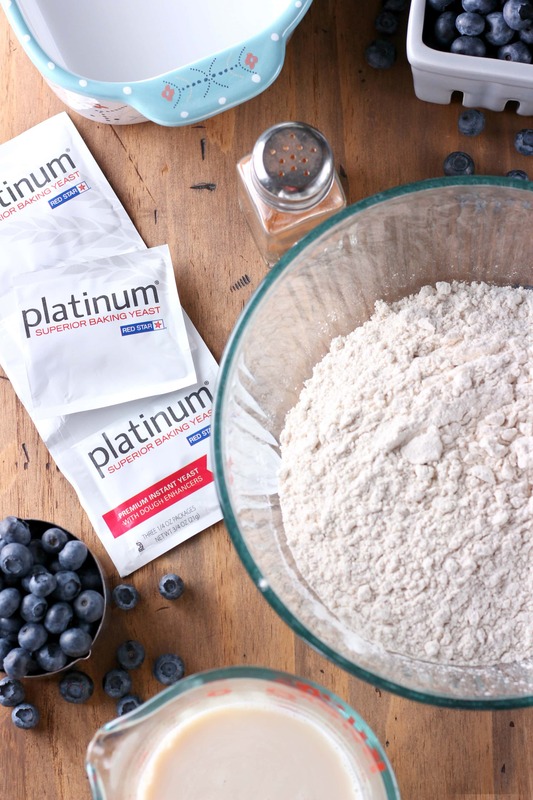 Just mix the dry ingredients together, add the wet ingredients, and beat until dough forms. Fold in the blueberries and spread in your prepared pan. Then let it rise. And just like in my other bread recipes, I used my favorite, dependable Platinum Red Star Yeast to make it. The dough rose perfectly giving the bread the texture that we love about english muffins. Depending on the temperature of your house, the rise can take a bit of time. But it’s worth the wait! Then you pop it in the oven and let it bake until the top is golden. (And while it bakes, your house will smell amazing!) Allow it to cool for a bit, then dig in to your new morning favorite! Lightly spray a 9x5 inch loaf pan with non-stick cooking spray. Sprinkle and coat bottom and sides of loaf pan with cornmeal. In the bowl of a stand mixer, combine flours, cinnamon, nutmeg, salt, baking soda, and yeast. With mixer on low, slowly add in warmed milk and maple syrup. Increase speed to medium, and beat until dough forms and pulls away from sides of bowl. Dough will be soft and sticky. Gently fold in blueberries. Preheat oven to 400. Bake for 25 minutes or until golden brown and internal temperature reaches 195-200 degrees F. Allow bread to cool in pan for 10 minutes before removing to a wire rack to cool completely. Pretty sure I could eat this for breakfast every day from now until eternity. Yum. I haven’t baked bread in ages and have really been wanting too! 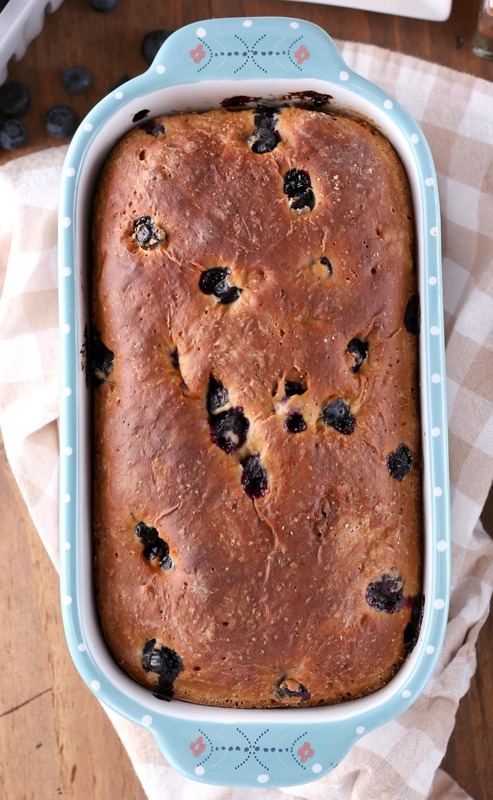 I love English muffin bread and can’t wait to try this blueberry version — this looks so good! I’ve always wanted to try English muffin bread, and this looks perfect! Love the blueberry flavor. Sounds wonderful for breakfast! This looks so, so good! Perfect for breakfast! Sorry about that! I’ve used both, and you can use either one. The loaf pictured used maple syrup. Thanks for catching that! English Muffin Bread is a weekly staple in my house. I absolutely adore your blueberry version!